This blog has been moved to http://imperfect.work. Existing content has been migrated over, new content will only show up on the new site. Thanks for reading! This entry was posted in Uncategorized on December 7, 2015 by yaozhenhua. No one remembers everything. In a large code base, we usually only know the details of a tiny part of it. Often times we have to search the code to know how things are defined or used across large number of files. Here I’d like to share a few tips to search source code. Many software including Visual Studio, notepad++, Sublime Text provide a multiple-file search option, such as “Find in Files”. I don’t use them too often, my alternative is “findstr /snipc:STRING files…” for literal string search. If the amount of files isn’t too huge, these non-indexing options are often acceptable. Note that “regex” in findstr is very limited. If you do need regex search, PowerShell Select-String cmdlet works much better. For pure source code in Git and you only need to search one repo, “git grep” is faster than brute-force search. If you don’t know this command, try it now and you will be surprised. Create a separate directory for all source code you may use. Store all repos/enlistments in this directory. Open “Indexing Options” in Control Panel, click “Modify” button and select the directory above. It will be listed in “Index these locations”. Indexing will take a while. Wait for a day or two. All above steps only need to be performed once. Later you can update the code as usual, and search the code in File Explorer. My source code stored in a spinning disk is about 50 GB with 240k text and binaries. Searching is instant (lower than sub-second), which is amazing for so many files. This entry was posted in Uncategorized on October 3, 2015 by yaozhenhua. Start Menu was introduced in Windows 95, it has been in use by many versions of Windows for many years. 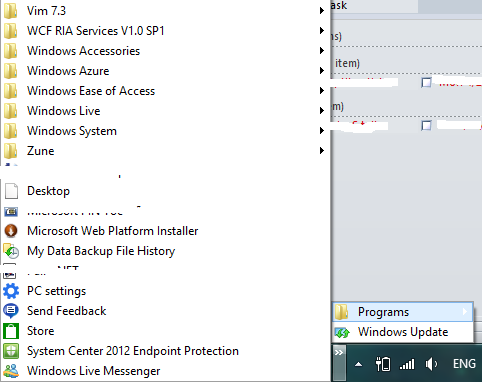 Now it’s gone in Windows 8, at least in Release Preview. 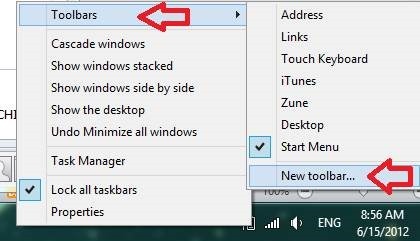 As a keyboard guy, I am used to directly type the app name partially since Vista, so it’s not a big deal to say bye bye to Start Menu. But sometimes I do want to see the hierarchical list of apps instead of sorting them alphabetically, particularly when there are duplicated names. 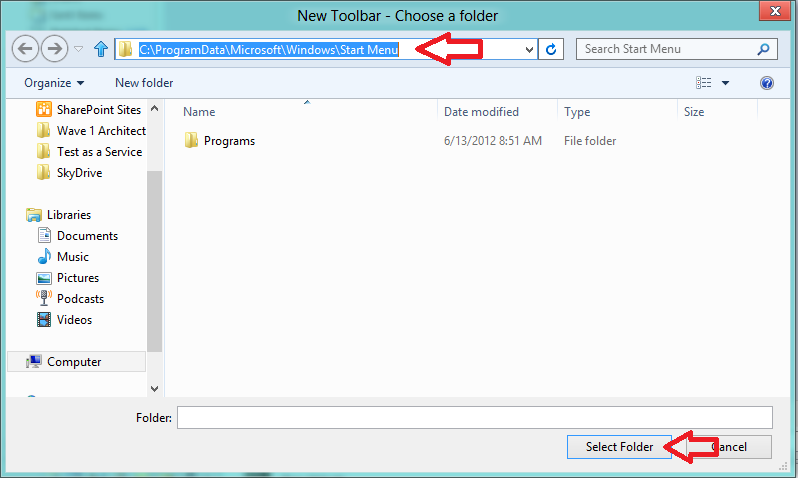 Here is the quick way to have a poor man’s start menu without using any app (in fact it’s a folder toolbar). 2. Browse to C:\ProgramData\Microsoft\Windows\Start Menu, and click “Select Folder” button. Note that C:\ProgramData is hidden directory, so you have to manually enter the location. 3. Enjoy the brand new poor man’s Start Menu! This entry was posted in Uncategorized on June 18, 2012 by yaozhenhua. This is a note of how to ensure the app.config file is copied along with assemblies for the project reference in managed project. Problem: suppose we have the two C# projects A and B, project A is referenced in B. When the project B is built, project A assembly will be copied to the output path but the app.config will not follow. to resolved references. Add new extensions here if you want to add new file types to consider. With the change, app.config will follow the assemblies in both the build and unit test. This entry was posted in Software development on May 28, 2012 by yaozhenhua. This is a note of how to automate the remote execution of a GUI program on a test machine. Note: you should not use this against a non-test machine because the autologon may impose a security risk. Scenario: there is a test machine “ZY” with Windows Server 2008R2 installed, and I want to automate the process of running a GUI program on it, the program itself is fully automated but cannot run in session 0. The basic idea is to use scheduled task to run the program in the login session. PSEXEC will not work because the process started from session 0 by NT services will be running in session 0, thus no GUI will show up. In order to ensure the program can be started after scheduled task is created, the given user must be logged on to the computer. This can be done by automatic logon. /ST must specify a future time. It is not important how exact the start time is, since we will use “schtasks /run” to run the command. If the current user is the same as the remote computer where we want to run the command, options /U /P can be ignored. It is important to use /IT in order to run the command interactively when the user is logged in. tasklist /s zy /u CONTOSO\MyUser /p MyPassword /fi "session gt 0" /fi "username eq MyUser"
If explorer.exe and dwm.exe are listed, the login has completed. schtasks /run /S zy /U CONTOSO\MyUser /P MyPassword /I /TN "notepad"
Note that the task name in /TN should be the same as the name in step 2. Refer to commands in step 1 and replace with “reg delete” to delete DefaultPassword and change AutoAdminLogon to 0. This entry was posted in Software testing on May 27, 2012 by yaozhenhua. For some reason I need to access a private field in a class in the system library. .NET provides a way to do it. I think it will be cool to share it although it is not a good coding practice that we will be using it on a regular basis. Hypothetically suppose we want to construct an instance of System.ConfigNode. This class is an internal class in mscorlib, and the constructor is internal too. So we cannot just use it as usual. BTW, the format for the code is horrible. I need to find a better way to handle this. This entry was posted in Software development on May 8, 2012 by yaozhenhua.